From the kitchen of One Perfect Bite...Julia Child stole my heart, but Patricia Wells grabbed all the shelf space as each of her thirteen books found a spot in the bookcases against my den walls. In an industry that has fallen victim to the cult of personality, this quiet and unassuming woman continues to write and teach and create gorgeous meals that define what good cooking should be. She does it without fuss or fanfare, and, fortunately for us, she records what happens in her kitchen. She studied art history and journalism in college. While she loved to cook, there were no food writers at the time she graduated, so she used her other skill and became an art critic for the Washington Post. Bored, she moved to New York and began to write about food whenever the opportunity arose. In 1976 she became a food writer for the New York Times and was finally able to combine her love of food and cooking with her writing. Two years later she moved to Paris to write for the Anglophone papers and, following publication of her first book, became the first woman restaurant critic for the French newspaper L'Express. In the intervening years, she garnered a James Beard Award for her writing and established a cooking school that is held in high regard. While French food is her forte, she now runs marathons and her work in recent years features lighter, healthier fare. I've selected this beautiful peasant tart to represent her recipes. It is delicious, simple to make and a perfect example of French bistro cooking. I hope you'll give it a try. 2) Place egg yolks in a large bowl and beat with a fork. Add creme fraiche and 3 tablespoons sugar, mixing until well-blended. Set Aside. 3) Peel and core apples. Cut them in half and then cut each half into quarters. Starting just inside edge of pastry shell, neatly layer slices, slightly overlapping them, in 2 or 3 concentric circles, working toward center of tart. Pour cream mixture over apples. Sprinkle top with reserved 2 tablespoons sugar. 4) Bake in center of oven until cream filling is set and apples are very brown, even blackened at edges, about 45 minutes. Remove to a rack to cool. Serve warm or at room temperature. Yield: 8 servings. The following bloggers are also paying tribute to Patricia Wells. I hope you'll visit all of them. Next week we will highlight the food and recipes of Lidia Bastianich. It will be really interesting to see what everyone comes up with. If you'd like to join us please email me for additional information. Everyone is welcome. Such a perfect looking tart, thta's all I can say. Except for a slice would be nice..
Mary, This tart is gorgeous! Patricia would be so proud of you! I'm bookmarking this. I have lots of entertaining this fall and your Apple tart would be prefect. I could lick the computer! That tart is a dream! Probably the kind she no longer makes, now that she is running marathons! Love patricia wells and often envied her lifestyle, with a house in Provence and a pied-a-terre in Paris! I love P.Wells books. She is such an inspiration. Your tart looks almost too perfect to eat! Thank you so much for taking the time to look around my blog! I tend to feel that it is a ghost town sometimes but I still write my posts nonetheless because I enjoy it. Your blog is simply scrumptious!! I was going to ask if you wanted the recipe for the oatmeal cake squares but I'm starting to think I will have to visit again to take a look at yours! 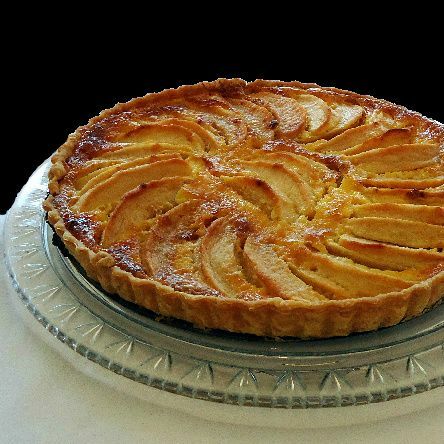 this is very similar to my mom´s apple tart and i love it. Wow! Anyone who combines apples and cream - then BAKES it has my vote for sure!! Definitely a master piece apple tart this one Mary! Good books and good recipes are a treasure :-). This tart is perfection itself Mary! You've outdone yourself, Mary! The tart looks absolutely glorious, and I love how few ingredients it requires. Mary, Thanks for your sweet comment on Season with Spice. Otherwise, I wouldn't have found One Perfect Bite and this perfect looking pie. Would love have a bite of this dreamy apple tart now. Mary, Such a beautiful tart and the perfect way to represent Patricia Wells. I have enjoyed learning more about Patricia Wells! Have a great weekend! I came late to the Patricia Wells table but I do like her food and her recipes. Although I do more reading of them than cooking of them. What a wonderful tart and I shall have to try it sometime. A keeper recipe for sure. I so want to make this. We go apple picking every fall so I will try this then. It is just beautiful. Thank you Mary! A flawless presentation piece. I just love the look and as always, a wonderful series! No cooking library is complete without a few selections from Patricia Wells! Absolutely lovely tart - picture perfect. Love that you picked this recipe for Patricia. I am a fan of this tart! The tart look absolutely gorgeous, Mary! I think it's time I cook more of Patricia Wells' recipes! I use her bistro cooking book all the time. Authentic and welcoming. This pie is the loveliest way to celebrate her accomplishments. And it really is so - French! What a lovely-looking summer tart! I have never heard of this wonderful cook, I am ashamed to say! Your tart looks simply perfect and delicious. Fantastic post! This tart looks absolutely lovely! Great photo too. I actually just 'discovered' Patricia Wells (don't know where I have been all these years... under a rock probably!) I recently made her Apple Lady's Apple Cake which was a great hit with my family. I will bookmark this recipe and try it soon - almost apple season here! I have a confession to make! I don't know who Patricia Wells is! Thank you for introducing me to her. This tart looks really really good. I'm really found of apple desserts and this one, I would love it, I'm sure about it... Plus I love Patricia Wells recipes, she's really great. Have a nice week-end Mary! Wow. Beautiful tart Mary, absolutely stellar. Proves you need just a few good ingredients and great technique to come up with something memorable! I wouldn't mind moving to NYC and writing about food when the opportunity presented itself! I can't say I'm faniliar with Patricia Wells' accomplishments, unfortunately... But that tart is an accomplishment in itself! It's stunning! It's really gorgeous. I think I'd rather have a slice (or two) than what I've planned for lunch! Oh this is such a beautiful looking tart..... Love it. I hope you don't see my comment over on Sam's blog. The one that says (out of 200+) I don't own one Patricia Wells cookbook and asked Sam to recommend one--or more. Contrary to what my family may think, my cookbook collection is far from complete. My husband will be pointed to this delicious looking tart recipe. Mary, what a gorgeous tart! I have yet to make a tart and this seems like an excellent place to start. And thank you for introducing me to Patricia Wells. I'm glad I had the chance to explore your blog today. The title "One Perfect Bite" sums up my food philosophy perfectly! Finally, someone who gets it! I just subscribed and will be in touch! This week I gained a new respect for Patricia Wells. She doesn't have the same visibility as some of the celebrity chefs these days so people may ot know her as well, but her resume speaks for itself. The tart you made is so representative of the recipes I've seen by Patricia Wells - simple but elegant. I have her vegetable harvest book, and really need to pull it out more. The tart looks wonderful. I'm dreaming about all those autumn flavors now. I absolutely LOVE LYDIA! I just requested her latest book from the library and can't wait for the new show to air on PBS. I'll be interested to see all the recipes that everyone tries. Have a great weekend! Absolutely stunning tart! I could gobble half of it up in no time. Julia Child always has a special place in my heart, love her. That tart is a work of art and I can only think that it tastes heavenly! You are a fan! 13 cookbooks? I'm impressed. This apple tart looks just beautiful. I love how precisely the apples are arranged. Thanks for organizing this delightful challenge! Such a wonderful example of someone who followed her passion with delicious results. The tart is a work of art, a fitting tribute to Patricia's passions for art and food. I've haven't tried many of her recipes, but if this is indicative of them, I've been missing a lot. Your rendition is beautiful. If this tart is as delicious as your photos make it look, I can't wait to try it! Gorgeous! Love the tart... I am sure Patricia Wells would be proud... Beautiful! I would love a slice of this! Great post, Mary! I need to check out some of Wells's older cookbooks and see what all of his French bistro food is all about! This tart looks absolutely delicious. Homey and oh so satisfying. A great classic--both the author and the dessert! 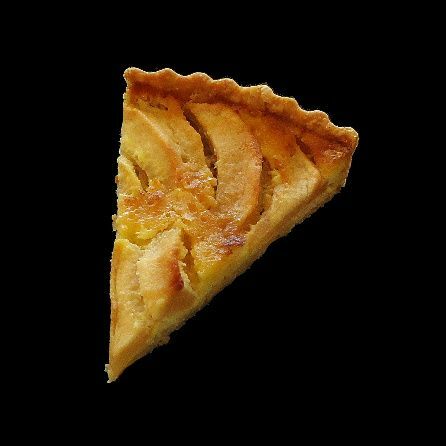 A great tarte aux pommes makes simplicity heaven. Beautiful tart! I'll be saving this to try when the weather cools some! What a nice tribute to Patricia Wells! Thank you. She has been an inspiration for my husband and me for many years, beginning with her (now out-of-date) Food Lover's Travel Guides to France and Paris. We took her cooking class in Provence 15 years ago and still use tips we learned from her then. And.....all of her cookbooks are the real deal.